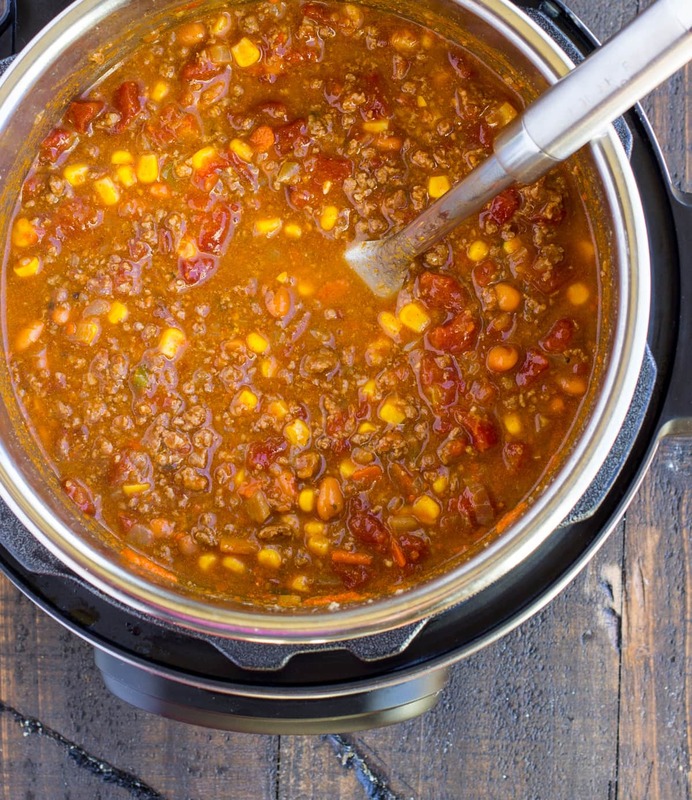 This Instant Pot Taco Soup recipe is an easy weeknight dinner, that’s full of all your favorite Mexican flavors. 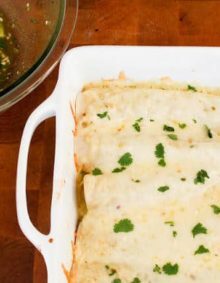 Serve with cheese, sour cream and avocado! Hi everyone! 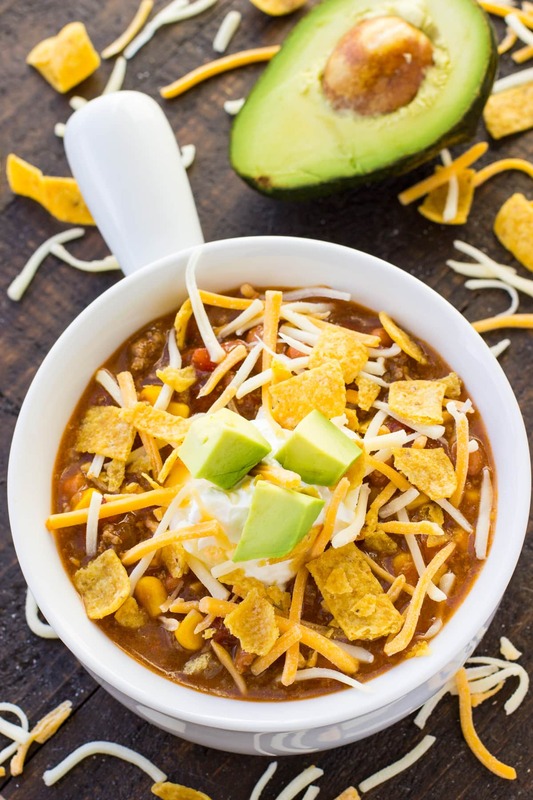 I’m Jennifer from Deliciously Sprinkled and I’m SOOO excited to share this delicious Instant Pot Taco Soup recipe with all of you today! With the holiday’s in full swing, it seems like we are just so busy that I don’t have time to make dinner and I’m really sick of eating out all the time. So I decided I was going to start using my Instant Pot that I got for my birthday to hopefully help me make dinner quicker and easier. 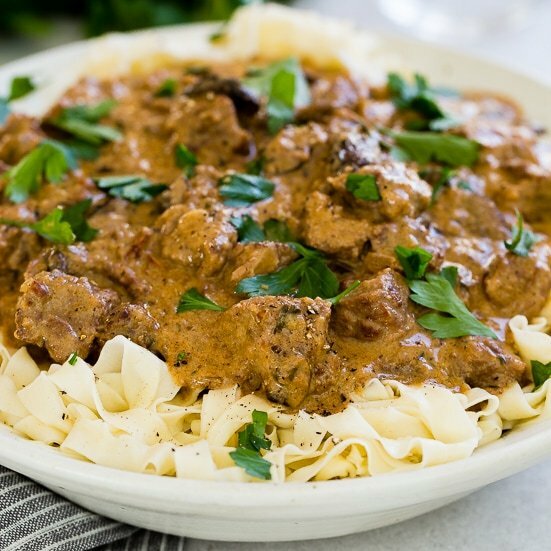 Well you guys, I seriously LOVE my Instant Pot, after I got over the first initial intimidation of it, I learned that it’s really so simple to use and it’s so nice that I can have dinner ready in less then 30 minutes. 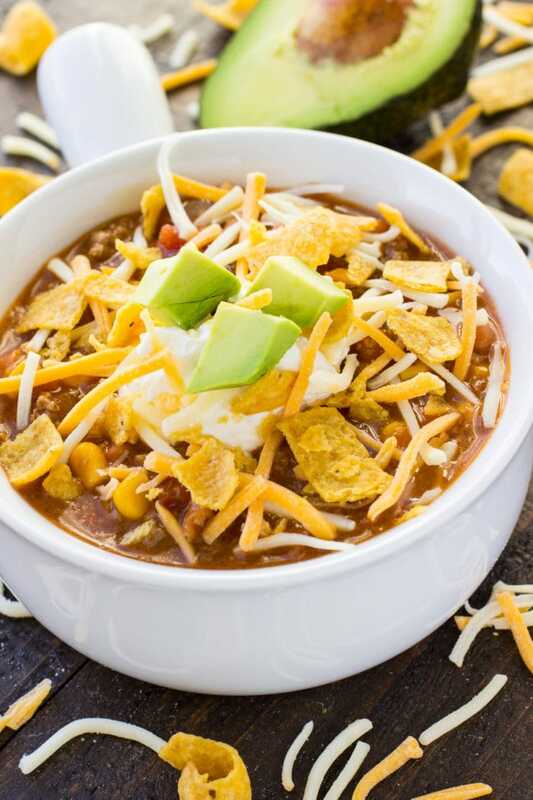 So if your like me and just got an Instant Pot and don’t know what to make in it, this taco soup is the perfect recipe to try first. My family loves this soup, my husband said he could eat this everyday! And don’t worry, if you don’t have an Instant Pot, I included my slow cooker instructions for you, as well. One of my favorite things about the Instant Pot is that you can saute meat and veggies right in the pot, no need to dirty a bunch of different pots & pans. So the first step, is to saute the ground beef and onions together until browned. After you’ve browned the meat, just dump the corn, beans, rotel, diced tomatoes, ranch seasoning mix, taco seasoning and beef broth into the pot. Stir and then set the Instant Pot to the soup setting for 20 minutes. Once the soup is done, serve with your favorite toppings. 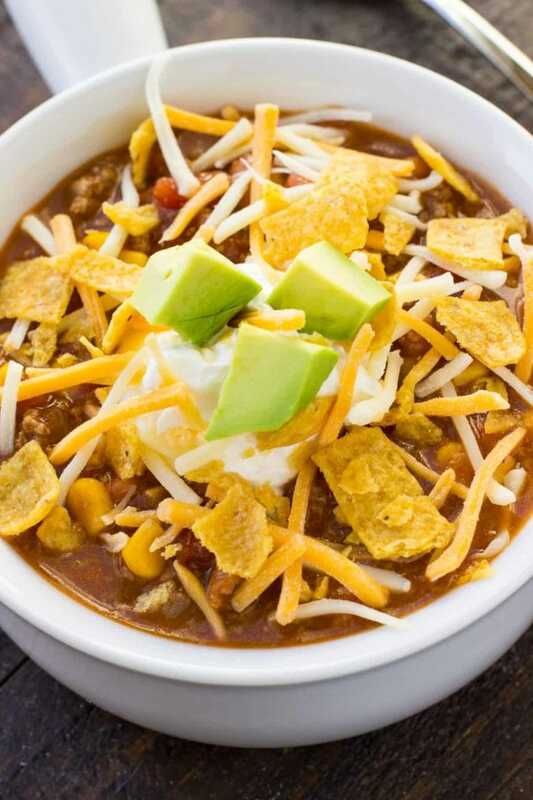 We like to top our taco soup with shredded cheese, sour cream, avocado and of course, Fritos. I know this Instant Pot Taco Soup is going to be a family favorite, like it is in our family. 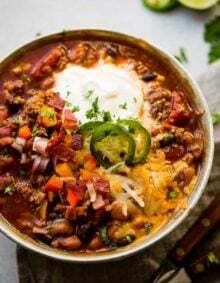 The BEST recipe for Instant Pot Taco Soup, this soup is full of all your favorite Mexican flavors and makes the perfect weeknight dinner. FOR THE INSTANT POT:Set the instant pot to "Saute" and add olive oil. Once hot, add the ground beef and onions, cook until meat is browed. Turn off instant pot and drain meat. Put the meat back into the instant pot. Add corn, beans, rotel, diced tomatoes, ranch seasoning and taco seasoning. Add beef broth and stir. Place the lid on and set the valve to "Sealed". Press the "Soup" button and set timer for 20 minutes. Once the soup is done, turn valve to "Quick Release". Serve soup with shredded cheese, avocado, sour cream and Fritos. FOR THE SLOW COOKER:Heat a pan to medium heat and add olive oil. Once hot, add the meat and the onions. Cook until meat is browned. Drain. Add meat and onions to the slow cooker. Add corn, beans, rotel, diced tomatoes, ranch seasoning and taco seasoning. Add beef broth and stir. Serve soup with shredded cheese, avocado, sour cream and Fritos. It’s as simple as adding a few ingredients to pot, but it comes out tasting like a labor of love! I have a pretty dumb question. I have never used a pressure cooker before and I have an off-brand one that has a “stew” button but no “soup” button. Are these the same thing? Hi Catie! I’m not family with other brands but I would imagine it would be the same thing. You could also just do Manual for 20 minutes. Enjoy! 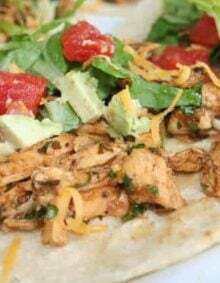 I never leave reviews, but this recipe was delicious and so easy! I just got my instant pot but have had a crockpot for forever. I’m so excited to be able to do things I love to do in the crockpot much faster in the IP. I was too nervous to freehand like I do in the crockpot since I’m not familiar with how much liquid to lose, time, setting, etc. I subbed corn for a can of black beans. I used chili rotel and fire roasted garlic tomatoes because who hates more flavor?! This was DELICIOUS and I will definitely be making again. Yay! Thanks for the feedback Wendy! So glad you enjoyed it! I have tried to make taco soup in my instant pot several times now, and every time I get the burn notification with it scorching slightly. I’ve tried it with the soup setting and the manual setting. I’ve even tried adding more broth to make it less thick. I’m so sorry this keeps happening! It seems like some Instant Pots are more sensitive than others. You could try browning the meat in on the stove in a different pan. *****Really great recipe! I added 1 can of green chilies and used 3 T each of taco seasoning and ranch powder ( I dont buy packets). I added a handful of cilantro to pot after cooking. I will make this often as my husband raved over it too. Love to hear this Deb! I love the addition of more green chiles! Never one to comment , but this was really great. Also never one to change a recipe and mention it because of the great taste they usually have… with that said… great , quick recipe. I did use Ranch Style beans “with jalapeños” and the Ready for Chili diced tomatoes… gave it a good Louisiana kick…. There you go! We are all about altering recipes to make them just how we like them! Thanks for taking time to leave us a comment, Doug! I got an instant pot for my birthday but haven’t used it yet. I usually make soup in my crock pot. Can I make the soup in the instant pot and then leave it in there for several hours like I would my crock pot? Yes, just push “warm” when it’s done cooking. This recipe is so tasty! I am making it for a potluck at work tomorrow! Yum! It is always a hit in our house! How did it go over at work?? Shoot! We are on it! Thank you for lettings us know the nutritional information is missing! 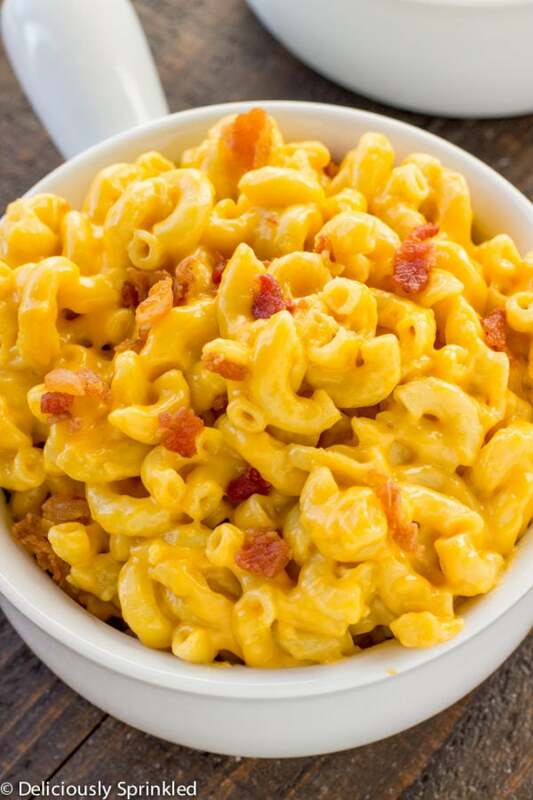 About to make this for the super bowl but not sure about can sizes for all items? I would love to make this, however I’m wondering if I could possibly purée the tomatoes so they aren’t in chunks?? My kids don’t really care for chunky bits of tomato. Do you think it would change he outcome of the recipe too much? Thanks for the note Kate. I wonder why ours doesn’t take that long to build pressure? Ours starts and is done in almost half the time. I’ll make a note in case there’s a difference in pots I wasn’t aware of. Thank you so much for pointing that out! Same with me! Started wishing I had just thrown it in the crock pot earlier. 😉 I’ll know for next time and allow more time to build the pressure. Oh dear! What model do you have? So you don’t drain the grease from browning the hamburger meat? If there’s a lot to be drained then you can do that. Do you drain your beans and corn? Thx!